I had to go to Milwaukee on Friday to do a training session for a company that purchased brand new equipment. I caught up to this truck. Instantly, I could hear the 1970's commercial that was generally on during Saturday morning cartoons. "Mister Owl? 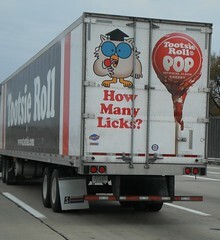 How many licks DOES it take to get to the Tootsie Roll center of a Tootsie Pop?" "One. Two. Three," and the owl bites the pop to get to the Tootsie Roll. "Three," he says and hands the half-eaten pop back to the boy. The announcer says, "The world will never know." I remember having contests to see how many licks but it takes a long time to lick off the hard candy shell. Invariably, those of us participating opted to stick the whole sucker in our mouth to make the thing dissolve faster. So, don't look at me. I haven't the foggiest idea either.